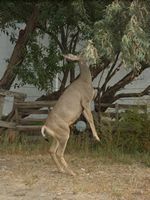 Today Barbara Clark and one of my spirit guides talk about her experiences with the wild creatures of Wyoming. If you’ve been with us a while, you know my spirit guides are fond of talking about animals—particularly about what great teachers and healers they are for us humans. Barbara was here in Wyoming in summer 2012. In this video discussion, recorded after she returned to Scotland, she talks to my guide to get his perspective on the magical critters of Wyoming. The conversation between Barbara and the spirit guide was a private reading. But after Barbara and I listened to the recording, we thought our readers would enjoy her and his perspectives on the animals. The animals of Wyoming gave me such a huge gift, it was absolutely magical. “As you know, we have always said, animals are often, almost always in fact, your best teachers, because they are so aligned with their higher selves, with their souls, their spirits, with God, Goddess. And the animals, here where John lives, in Wyoming, are not used to people like you or like him. People who can communicate with them. Everybody can communicate with them, but few do, especially in a place like this and so, they recognised a kindred spirit in you. And it doesn’t matter what animals we’re talking about, the deer that visited you in the back yard in the mornings, the crows, the eagles, the rabbits. They were clustering around you because they loved your energy. They knew they were safe, they were loved, there was no danger there, they just simply wanted to be in your energy. Even the wolves that you talked to telepathically, they picked up on that too. And we can tell you, with certainty, that some of those wolves who would have been shot and killed when Wyoming opened the season on them on October 1st did move in to a safe place. Perhaps it was Yellowstone, it probably was Yellowstone for some of them at least, because they’re safe there..…. Deepest gratitude to those beautiful creatures, that incredible land, Spirit and, of course, John Cali. What is your relationship with animals, wild or domestic? Do you believe you can talk to them? Please share your thoughts and comments with us below. My original intent was to share a 2012 radio interview with Teal Scott in which she speaks about critters but just now changed my plan. Through the month of April I have spent a lot of time every day sitting on a bed near a large window next to a balcony railing. Doves were particularly active partly due to the fact that the mulberry tree was heavy with fruit due to the this particularly rainy year. I was inspired to watch them very closely and I learned something which I believe is both contraversial and illuminating. These birds have rituals which they lovingly go through while attempting to propagate. That was no surprise. What was a surprise is that I repeatedly verified that after the earlier sometimes hourly sessions for the first couple weeks something changed. The males began to act out the same rituals with each other. So much for the idea that this type of enjoyment and unconditional loving is unnatural. The intervals between these manifestations were however much longer. We have so much to learn from these birds of a feather, lol. Thanks very much, Ron. I agree — we have much to learn from the animals. John, I am not getting the link for the elephant and dog video. When I clicked on the link, there are several choices but the particular one with the dog and elephant is not there. Thanks very much, Claire. I’m delighted to see that happening. It is of great interest to me John. Thanks for letting me be a part of this conversation. In the conversation one can feel there is so much love for all living animals. You’re most welcome, Pim. And thank you for being a part of this. I enjoyed the video, and I think it is a great idea and would love to see more. I have always had a connection with animals. I talk with them all the time. Sometimes I understand what they are saying, sometimes I don’t, but in either case I enjoy our time together. I have lived in Wyoming most of my life, and although I love to travel, I can’t see myself living anywhere else. I have had many encounters while backpacking, hiking, camping, fishing, and, yes, hunting in the wilds of Wyoming. I know it sounds horrible, but I’ve been an avid hunter most of my life. I love the hunt, and I can’t explain why really. For me, the hunt is much more than going out to kill an animal. I am not after a trophy. I also try to honor the animal to the best of my ability, but I have no cultural background that I have been taught…I just kind of do what ‘feels’ right to me. If there is a ritual of some kind that would honor the animal hunted, I would very much like to know. Animals are not the only ones I feel a connection with, and not to change the subject, but is there anything on rocks? I have always felt a connection and fascination with rocks. Agates, opal, obsidian, petrified wood and the like. Thank you all for sharing your video. May the leaves of the forest shade you. Much love, Damian. When I was much younger, I also was a hunter. But no more, especially since I’m a vegetarian now. But, as I understand it, some of the Native American cultures honored the wild animals they used for food by asking the animals’ permission. They also used every part of the animal — nothing went to waste. As for rocks, Chief Joseph mentioned in the “Tuning In” movie that even rocks have a consciousness. I do not remember his exact words. My life is so involved with animals … and I learned so much and changed with them … Dogs and horses when I was a child, then I had a dog 14 years … rabbit, birds, fish … I can not live without nature, I have always chosen to live near … In the garden, there are also wild animals, many birds, hedgehogs, mice, an old rat. A nice squirrel lived here and ate walnuts but I found him killed… Maybe cats have attacked … and elsewhere there is a stray cat at the moment, I give to him to eat but as I have also birds in my house, I hope he will find another place ..
Communication is direct with animals, they feel our emotions … One of my greatest joys is with a friend’s horse. With my son, we are playing with him, and he ran along its meadow when I came in bike to see him. One day when I was getting into the walk, I got to stop galloping just talking to him. Does the Spirit have anything to say us about all this? To answer your question, Chief Joseph and my other spirit guides have talked about vegetarianism. But only once that I recall, and that was years ago. It’s can be such a contentious issue — veganism/vegetarianism versus meat-eating. I suspect that’s why we haven’t talked about it much. What they did say at the time was each individual needs to follow their own inner guidance. It was a lovely video, thank you for sharing. I really enjoyed it. Thank you, Jeannie, for your kind comments. I really enjoyed the chat and making the video. I really enjoyed the video and would enjoy more of them. I have my own personal love of all animals and believe they teach us so much. I especially enjoy pictures that circulate on the web where we see unlike species nurturing one another. Each time I receive one of those pics, I am in awe and think humans are so arrogant in thinking they are the highest form of intelligence in the animal kingdom. Unlike species nurture each other when they need to “step up to the plate”. As an example I received a small video of a retired elephant that had been befriended by a small dog. The two were inseparable and appeared to be “soul mates”. The dog became ill and the elephant waited outside the animal hospital for days until the dog had recovered from an emergency surgery. I like to talk to the animals myself and find it very gratifying. It won’t take much of your time — it’s less than 3 minutes. What a heartwarming video….maybe our ability to speak is what causes so many conflicts among humans. Animals get down to the basics of relationships. Thanks John, I really loved and enjoyed listening ! I love animals my whole life and I always will because of the things chief Joseph mentioned ! Thanks for sharing that wonderful video of Wyoming with yourself, Barbara and Spirit! I used to live in Cheyenne and traveled around Wyoming and enjoyed the open and flowing energy of the state. At the military base in Cheyenne, the antelope are protected and they lowered the speed on base to 10 mph from 30 and you are fined if you hit an antelope. So, there are a lot of antelope on base taking advantage of the safe haven there. I feel showing respect for all life allows compassion within us and it will respond to us in like fashion. The presence of the animals really helps the people feel more connected to nature and I feel it helps people to be more relaxed and calm. You’re right — the energy here is open and flowing. 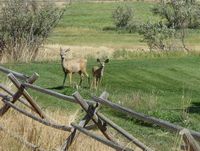 Not everyone in Wyoming views animals as you, Barbara, and I do, but more and more are coming to that perspective. I think it’s just simply part of the growing awareness, heightening consciousness all of us are experiencing. John, I so loved watching this video and listening to Barbara and Chief Joseph. I have the same experience with animals here in Wallowa and now I understand better why I do. Thank you. I do appreciate this format…hearing you both talk. Thank you. Thanks very much, Whitney. I know you know this, but not everyone reading this does — Wallowa is the ancestral home of the historic Chief Joseph. It’s a magical place. Ahhh, a reading after my heart and Soul ~! I was adopted by a man-hating “Golden Wolf”, a Chow Shepherd mix. I had 4 and a half years of the most blessed LOVE of an animal, that a man or woman could ever have. When it was time to let him go HOME, he let me know he was ready, and he kissed me good-bye. I was the ONLY stranger in his life that he trusted, and tried so hard to meld with. We truly had a Mutual Admiration Society,,, even if we DID sing off tune and off key~! My Lady says, “I had a quiet dog, until you taught him how to sing~!”,,, but she totally understood our relationship, and was thankful for it. My rabbits, ravens, Finches, they have no fear of me. We don’t have deer here, but we do have wild-life, and in abundance. So, yes,,, When the Integrities of Spirit match, the results are beyond magical. They are as God, speaking one to another, one FROM another. Thanks very much, Conshana, for sharing your deeply touching dog story. As you said, the animals are speaking as God to and from one another — and to us humans. Animals teach me un-attached love – to give and receive. Lot of judgements and other drama we have with regular people are not there. So it seems like the love is more un-entangled and pure. and thats why there is lightness as we have no major expectations. Its like we play and we go. Thank you very much, Chuck. As you said, our relationships with animals are so un-entangled and pure. As Chief Joseph has said, they are often our greatest teachers and healers.